Jaap Stam was a product of the Zwolle youth academy. He made big impact when playing at Dutch giants PSV Eindhoven. Stam made international experience and soon he was followed by Man United who offerend him a contract in 1998. 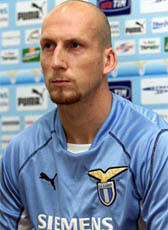 After publishing his biography during his stay at Manchester United, Stam was forced to leave the club. He joined AC Milan in July 2004. He returned home in summer 2006 to sign for Ajax Amsterdam a to play his final two years of professional football. Suddenly he decided to hang up his boots on October 29 2007. He announced his decision saying that he could not find 100% motivation to play football anymore. After his player retirement, Stam went on coaching courses. He started his coaching career at his first club, Zwolle. From 2009 to 2013 he was assistant coach at the club. In January 2013 he announced his departure at the end of the 2012-13 season to begin a new coaching career. Stam signed a 3-year contract at another former club, Ajax, to strenghten the coaching staff. Did you know Jaap Stam his cousin Maurice van Ham also played professional football abroad?